Hollywood isn't really the stereotypical Christmas scene. Set in Southern California, it doesn't get any snow, there aren't any evergreens, and the lights are bold and in your face instead of soft and atmospheric. But that doesn't mean you can't put tinsel in Tinsel Town and enjoy a more casual, Southern Californian style Christmas season. And who knows, you might even spot a familiar jolly old guy flying by the neighborhood! 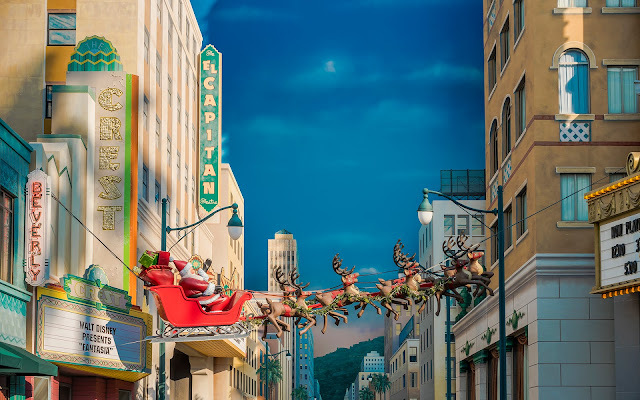 Santa Claus soars in front of Hollywood Blvd with his reindeer.